In the United States, the flu season usually runs from fall through early spring. Although the World Health Organization declared an end to the 2009 H1N1 flu pandemic, the H1N1 flu virus is expected to circulate again this flu season, along with other seasonal flu viruses. The single best way to prevent seasonal flu is to get a yearly flu vaccine, but good health habits and antiviral medicationsalso help protect against the flu. 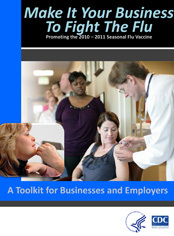 To help businesses, employers, and their employees learn about these strategies for preventing flu, CDC has developed a "Make It Your Business to Fight the Flu" toolkit, flyers, posters and other materials to post and distribute in the workplace. View hand washing and hygiene signs at ComplianceSigns.com.